It is my honour and privilege to oversee the future of the IASL as its 13th Director, and I invite you to join us here in Montreal as a master’s, doctoral, certificate, or exchange student at the Institute. In addition, we regularly welcome post-doctoral and visiting fellows who wish to pursue advanced research under the supervision of Institute faculty. You will find that the IASL is also an integral part of one of the world’s most vibrant and internationally-focused law faculties, where professors specialise in virtually every facet of international law and policy including the burgeoning field of international arbitration. The Institute’s own research agenda focuses on the transsystemic legal, public policy, and governance issues affecting the two dynamic sectors that we study– recent highlights are publication of a major treatise on the sustainable development of air transport in an era of carbon emissions reduction, a new textbook on modern principles of public international air law, and a massive multi-year project to clarify the international law rules on the military uses of outer space. If you aspire to be a specialist in air and space law, holding graduate credentials that will be recognised and respected throughout the world, please consider McGill and the IASL as the place to pursue your professional aspirations. I encourage you to contact me if you have any questions about our programme and our mission. I am brian.havel [at] mcgill.ca (subject: Interest%20in%20the%20Institute%20of%20Air%20and%20Space%20Law) (available by email). You should also feel free to contact our resourceful maria.damico [at] mcgill.ca (Administrator, Maria D’Amico), who will be happy to help you also. 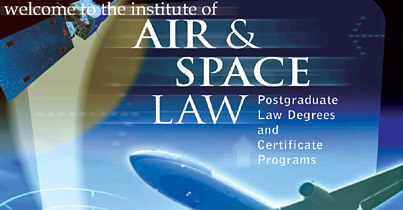 For more information about the Institute, its history, accomplishments and how to apply, please find the brochure 65 Years of Excellence in Air and Space Law here. A presentation of the Institute of Air and Space Law by Professor Ram Jakhu. The latest brochure about the Institute of Air and Space Law, its history, accomplishments and how to apply. Publications of the Centre, including the Annals of Air and Space, the Monograph Series, are available for purchase through HeinOnline.